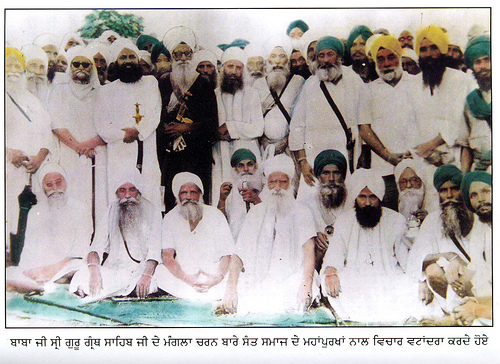 This article mentions the circumstances in which a meeting of all respected Saints and Gianis was held at Nanaksar, Jagraon, Punjab, India. The article refers to the picture as shown above and also in flicker sarups. Sometimes a human being studies to such a high level that he feels it is in his jurisdiction to question all before him. It is due to his belief that he has studied and accomplished more than others which allows him to examine and doubt even the most universally accepted principle. Once this man no longer considers the opinion and teachings of others, he has fallen into the endless trap of ego, and at this stage, he thinks that not even the teachings of Guru Sahib are above his knowledge. The moment the line is crossed, when one believes himself to be more educated or intelligent than Guru Sahib, the road to self-destruction can not be avoided. During the early 1900s there were only a few people who were like the person mentioned above. However, nowadays they are sprouting like mushrooms and are always planning to make a change to how they perceive Gurbani should be written, instead of accepting it in the same way and format in which our Guru Ji wrote it for us. Over time, the number of these people has increased, and there are now scores of instances occurring in which these so called more intelligent and educated people step forward with a theory that disowns the teachings and methods detailed in our Sahib Sri Guru Granth Sahib Ji. Based on this introduction, a similar occurrence took place in the 1950s, and it was the origin of this controversy which gave rise to the humble gathering of all the prominent Saints of the time. Considering how the Sikhism is the most modern of all major world religions and is the only religion whose sacred text (Sahib Sri Guru Granth Sahib Ji) is still in its original form, it’s unfortunate to see the many controversies which fake scholars raise from nowhere. A prime example of this was seen during the early nineties when someone questioned the ending portion of our holy Guru. This text (RaagMala) they say was not Guru Sahib’s Bani, and in spite of their unwarranted claims, it still remains a part of the teachings of Sikhi and is read in it’s entirety at Sri Akhand Paths across the world. History shows how Sahib Guru Gobind Singh Ji compiled the Damdami Bir (original saroop) of Sahib Sri Guru Granth Sahib Ji at Sri Damdama Sahib and strictly ordered that no change can be made at any time by anyone. However, it was during the late 1950s when a so-called ‘scholar’ questioned the ‘Manglachar’ of Sahib Sri Guru Granth Sahib Ji. What is Manglachar you ask? It’s the part of Gurbani in some instances, where our Guru Sahibs have inscribed various shabads with "Ik Onkar Sat Gur Parsad" before the mentioning of the leading "Mohallas." However, in some instances, there are shabads where "Ik Onkar Sat Gur Parsad" is written after the "Mohallas". Therefore, based on this, the person said that "Ik Onkar Sat Gur Parsad" should always be written and pronounced before the "Mohallas." As this same individual was a leader of the Sikh Community, he made an order to print Sahib Sri Guru Granth Sahib Ji in his preferred version, and that all older (and original) versions should be disposed. As you may be thinking, how could this happen? Well, as you are also well aware of, these types of incidents are still happening today. In today’s setting, the political authorities issue "Hukamnamas" according to their will and everyone is expected to follow in accordance. However, due to the huge magnitude of this issue, and how one man was trying to change Gurbani, the Sant Samaj meetings were held at various places at different times. During this meeting at Nanaksar Kaleran, all the Saints at the time, the main Jathas (groups) and prominent Gianis were all called together. The total representation at the Sant Samaj was very impressive and included major groups such as Nanaksar, Damdami Taksal (Bhindranwale), Rara Sahib and countless others. During this meeting, all attendees opposed the change, and during the course of the issue, many meetings were held to formulate means to correctly get the appropriate action brought to the person who incorrectly promoted his belief to the sangat. Over time, the controversy died down when the person accepted his mistake and all original Birs were restored in their entirety.